Do you use coconut milk in your cooking? 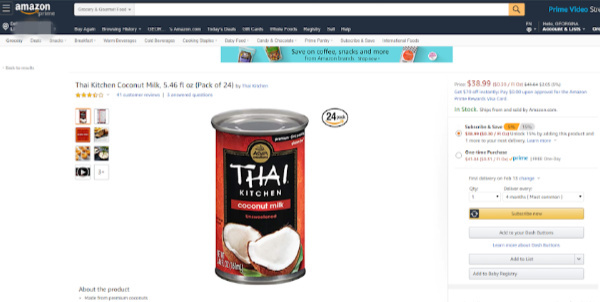 I’m huge fan of the Thai Kitchen brand, which you can easily buy in grocery stores – but did you know that you can also buy it on Amazon? 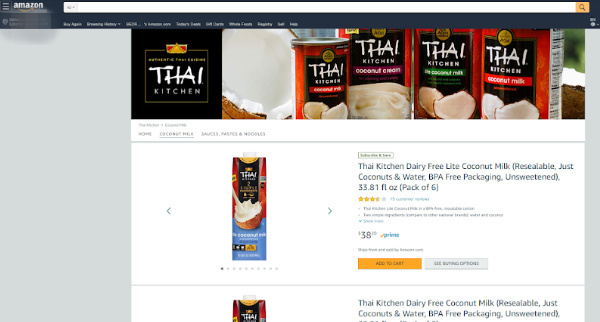 There’s even a special page for all the Thai Kitchen products! I’m already an Amazon Prime member, so ordering was super easy! I love using coconut milk for Indian and Thai recipes – especially soup!! But of course that’s not all you can do with it. 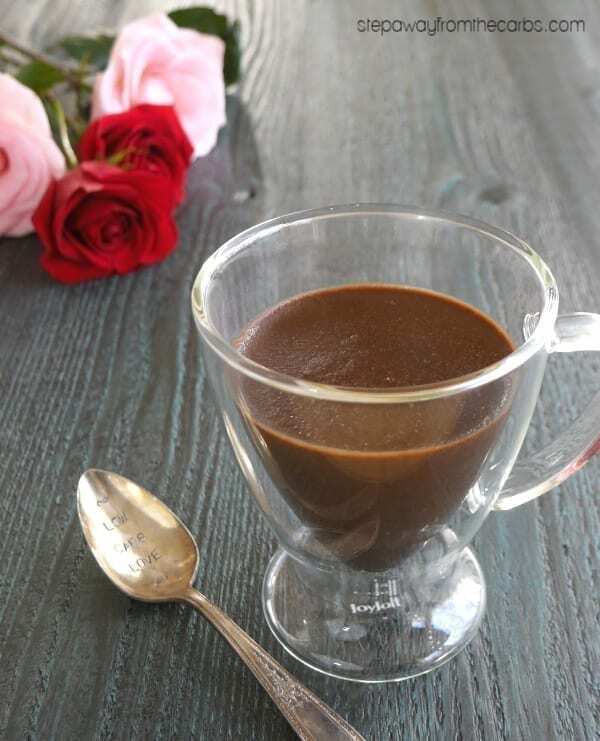 Because it has a mild flavor, it’s a great alternative to dairy milk in all kinds of recipes. You could use it in smoothies, sauces, or even add it to your coffee! 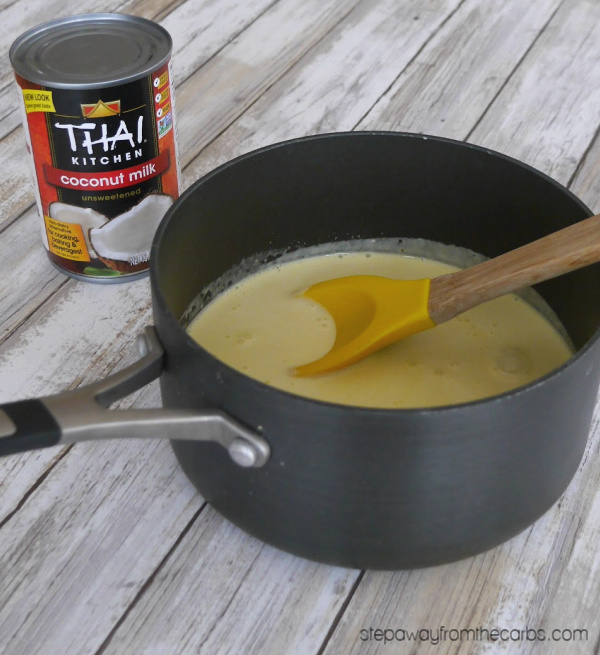 Thai Kitchen Coconut Milk only contains three ingredients: coconut milk, water, and guar gum (the latter ingredient is a natural thickener that adds creaminess to the coconut milk). 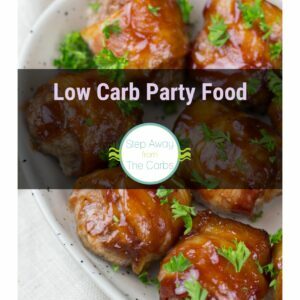 It’s gluten free, vegan, and paleo, plus there’s no artificial colors or flavors. 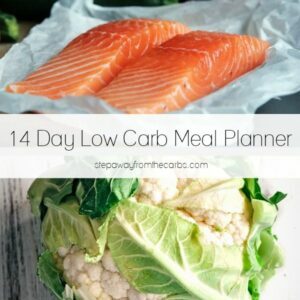 One serving (a third of a cup) contains just 1g net carb! 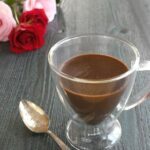 So, given that it has a similar texture and density to whole milk, I decided to use it as a substitute in a recipe that I’ve been wanting to make for ages: Chocolate Pots De Crème. 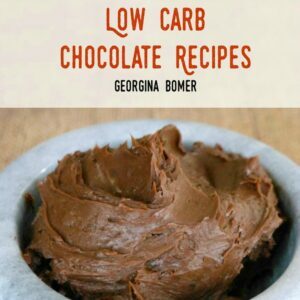 Yes – finally a sweet recipe! The coconut milk works perfectly in this indulgent dessert, and yet it’s still low carb and is unsweetened! To make the custard base for this dish, beat low carb granular sweetener (eg xylitol or erythritol) with egg yolks in a stand mixer. Add some heavy cream and the Thai Kitchen Coconut Milk. Stir well, then transfer it to a saucepan. 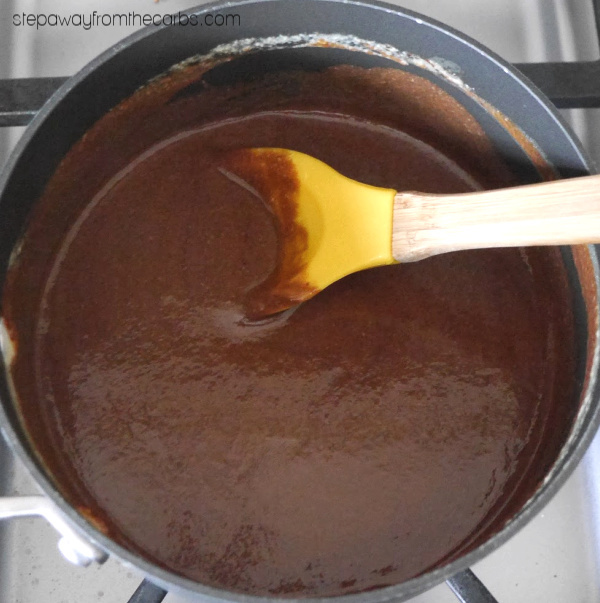 Cook the mixture over a low-medium heat until it starts to thicken, stirring frequently. This may take about ten minutes. 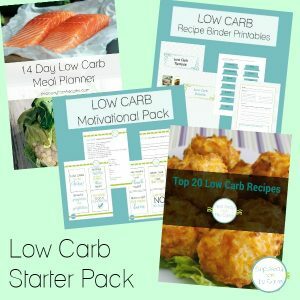 Break up some low carb chocolate (check out my suggested chocolate bars in my guide to 50+ Low Carb Treats!) and add it the custard. Turn off the heat, and stir the chocolate so that it melts into the milk liquid. 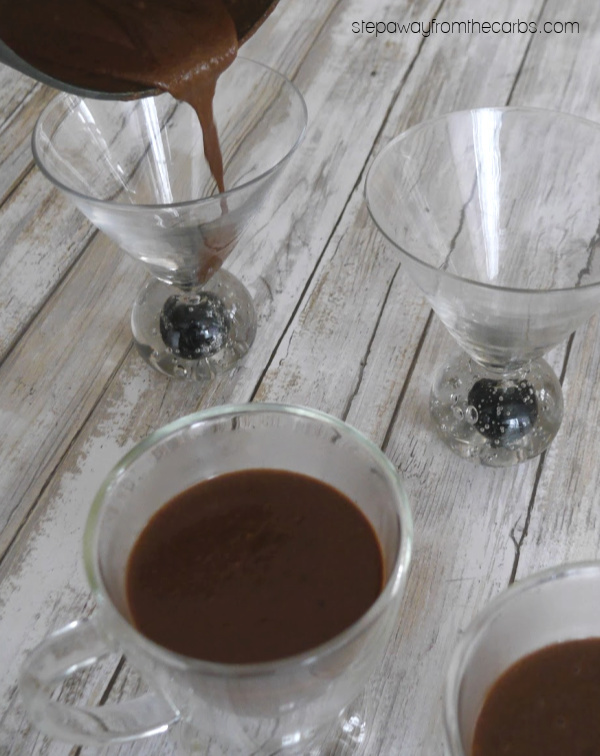 Pour the mixture into serving glasses, bowls, or cups. Let stand at room temperature until cooled, then place them in the fridge for at least four hours or until set. 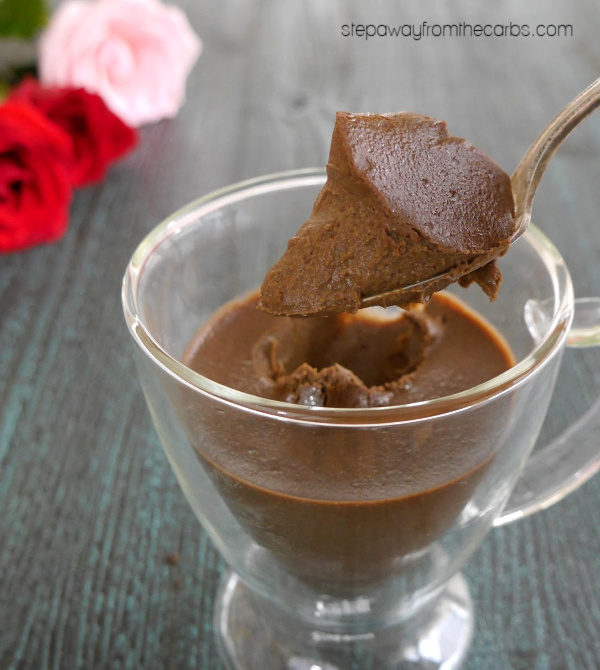 These Chocolate Pots de Crème are a rich and indulgent dessert! 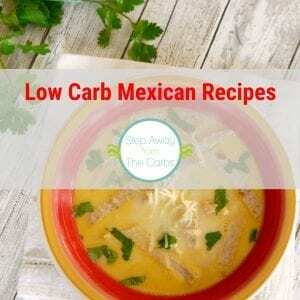 Low carb, sugar free, keto, and LCHF recipe. Beat the sweetener with the egg yolks in a stand mixer until pale. Add in the heavy cream and Thai Kitchen Coconut Milk. Stir well, then transfer it to a saucepan. 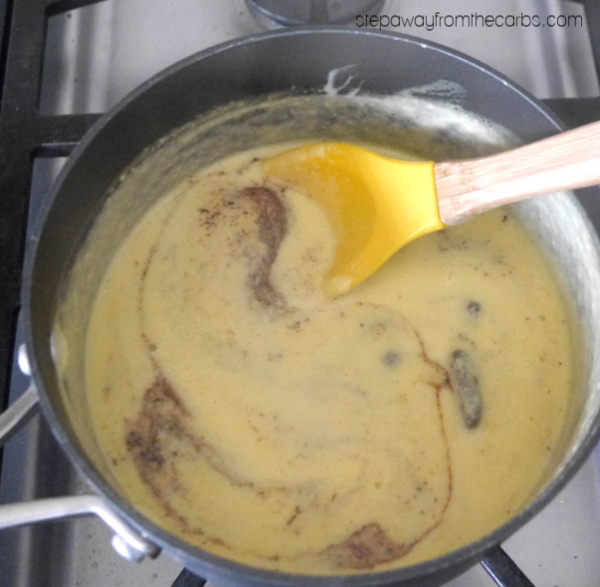 Cook the mixture over a low-medium heat until it starts to thicken, stirring frequently. This may take about ten minutes. Break up the low carb chocolate and add it the custard. Turn off the heat, and stir the chocolate so that it melts into the milk liquid.